This weekend was different from the last two, although Saturday’s temperature was much higher than normal (Sunday’s was lower), but there were far more Goldfinches and House Finches than in the previous two weeks. 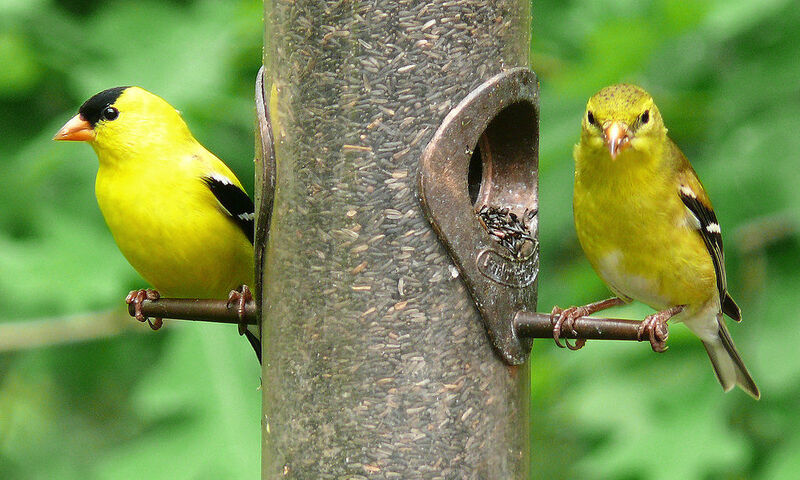 Between them they accounted for only 13% of the species seen, but Feeder Watch also wants to know the greatest number you see at any one time, which is where the big difference was: 12 Goldfinches and 6 House Finches were the high numbers; that was 42%+ of the total birds seen! Supporting species are usually the Carolina Chickadee and Tufted Titmouse, and their numbers were good. Two white-breasted Nuthatches showed up, and there were four Juncos, a rise from weeks previous. Although we have seen up to six different Woodpecker species when reporting for Feeder Watch, the regular visitors are the Red Bellied Woodpecker, Hairy and Downy Woodpeckers, all seen this week. The other species (Pileated, Northern Flicker and Yellow-Bellied Sapsucker) aren’t around until later although The Pileated was heard. Mourning Doves were in short supply; only one was seen this week again. They’re not coming like they did last year even though the Safflower seed feeder they like to feed under is unchanged. Maybe they’re put off by the green growth under the safflower feeder, the presumed result of feed germination during the much warmer weather. Other regular visitors were the Northern Cardinal (2), Carolina Wren (1), White-Throated Sparrow (1, a low number) and Blue Jay. The unexpected treat was a solitary House Sparrow, usually seen only two or three times a year!